Hi-rise hanger size markers are a useful, cost effective way to allow your customers to see where their size is on the sales floor. Size markers will keep your merchandise organized and accessible. Our size “10” marker slips over standard metal hanger hooks so that your customer can see the size on each garment. 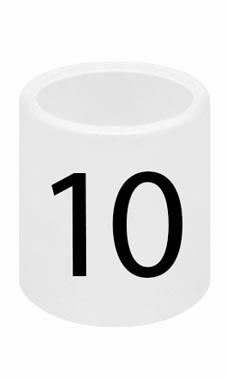 Our markers feature a ½ diameter round plastic white piece with a black number(s) to indicate the size located on 3 sides. 50 markers per bag.